Today, Dan Martin earned the second Tour de France stage win of his career and in doing so became the first ever UAE Team Emirates rider to claim the coveted prize. The Irishman, who finished sixth in yesterday’s race, has looked strong in the saddle all week and had highlighted this stage as one of his main goals for the Tour. The team protected Martin well throughout the 181km route from Brest to Mur de Bretagne allowing him to match all the attacks and accelerations in the final kilometres of the race. On the final climb to the line, Martin timed his own attack to perfection and, as the gradient ramped up to 12%, he animated the race by powering away from the peloton and holding off the chasers to take UAE Team Emirates’ first stage win of this year Tour de France. Commenting on today’s result, Martin said: “This is such an amazing feeling for me after so many second places at the Tour since my last one victory in the Grande Boucle. I was really relaxed all day and I was really looking forward to having a crack. When we got closer to the finish I was a bit nervous because of the head wind and I didn’t think it was going to happen. Then the race went really hard during the first part of the climb and a lot of riders got dropped and at that point I noticed that I didn’t have any team mates left so I thought why not have a try – and I did. Tomorrow’s stage 7 leaves Brittany from the town of Fougères, and heads west towards Chartres along a flat 231km route. Whilst the stage is relatively simple, it is the longest in this year’s Tour. The course is also known for its fierce cross winds in the final kilometers, which will force the formation of echelons and cause problems for the riders hoping to contend a bunch sprint finish. 12 July, 2018, Mûr-de-Bretagne Guerlédan (FRA): Greg Van Avermaet secured a fourth day in the leader's yellow jersey at the Tour de France today after another strong performance from BMC Racing Team saw both the Belgian rider and his teammate, Richie Porte, right up at the front in another tense finale. Van Avermaet goes deep on the day's final climb. The Mûr-de-Bretagne, a 2km long climb with an average gradient of 6.9% and pitches of up to 10%, was the talking point of stage 6 as the peloton had to tackle the tough ascent to the finish line twice in the final 20km of the race. Earlier in the stage, five riders formed the day's breakaway after attacking right off the bat and opening up an advantage that reached the five-minute mark after 20km of the 181km course. It was once again BMC Racing Team's Patrick Bevin who set the early tempo at the front of the bunch as soon as the leaders went clear and he limited the gap to inside seven minutes heading over the Côte de Ploudiry, the first of four categorized climbs. Crosswinds on an open section of road heading into the final 100km of the stage saw the peloton split with Quick-Step Floors moving up to the front to drive the pace as BMC Racing Team's strong positioning made sure all eight riders made the cut in the first part of the peloton. The bunch came back together approaching the 72km to go mark but as a result of the injection of pace, the gap to the leaders started to fall quickly before settling again at two minutes. With the chase heating up once more, the peloton eventually crossed the finish line at the top of the Mûr-de-Bretagne to begin the final 16km circuit altogether after catching the last remaining breakaway rider just before the summit. Jack Bauer (Mitchelton-SCOTT) tried his luck by going solo at the front of the race just after the bell rang while behind, Van Avermaet and Porte sat well-placed in the first few positions of the reduced bunch, tucked neatly in the wheel of Stefan Küng. The late attacker was caught with just under 5km to go as the continued increase in pace saw more riders falling off the back, but Van Avermaet and Porte remained poised and ready at the front for the battle to come. As the road kicked up for the final time and the first moves began, Porte was hot on the heels of his rivals with Van Avermaet also sticking with the heavily whittled-down front group. 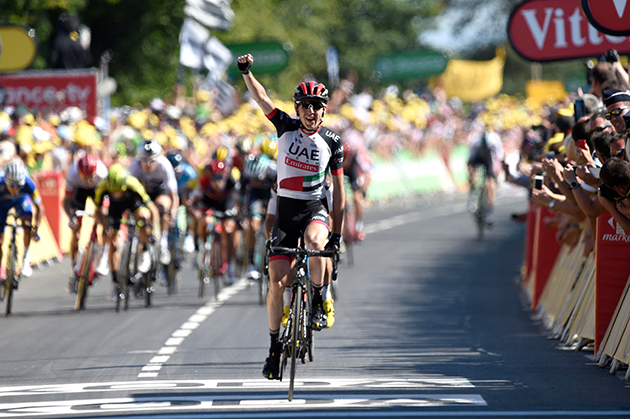 The decisive attack of the day came from Dan Martin (UAE Team Emirates) who was able to hold of a select chasing group, led by Porte, in the final kilometer to take the stage win. Porte and Van Avermaet crossed the line side by side in 11th and 12th place respectively which was enough to secure the current race leader a fourth consecutive day in the yellow jersey. A reshuffle of the General Classification saw Porte move up to 11th overall, 53 seconds behind his teammate, while Tejay van Garderen, who finished just behind the first group, now sits third, five seconds back. "It was a great ride by Martin and I was expecting something like that from him. He is good at picking the right moment. I think if you win a stage like this after attacking from that point then you are the strongest guy. We tried to do a good job and Richie tried to set a good tempo for himself and to try and take some seconds over the rest of the contenders. I just hung in there as well as possible to maybe try to sprint but in the end, I had no power anymore. It was a super hard final climb and the tempo never slowed down. But I am happy that I could stay up there and only a few guys could hold the tempo on the climb. Overall, it was a good day and I have another day in yellow to look forward to." "For sure, I am now thinking about the stage to Roubaix. It's going to be a hectic stage and maybe the hardest one of the week but first, we have two stages to get through and you always have to concentrate in the Tour. Something can always happen but I hope to go into Roubaix in yellow. It's the closest stage to Belgium and I like the cobblestones so, let's go for it." "Today's stage was a nice one to tick off. Yesterday and today were pretty stressful days coming into them but we didn't lose time and we put time into some guys. For me, I got stuck on the front a bit but once you are there, you might as well stay there. I don't have the punch to drop off and come back. Greg kept the jersey too so it was a good day for us." "It was a good GC day and it will be interesting now with Team Sky to see if they back Geraint Thomas or Froomey." 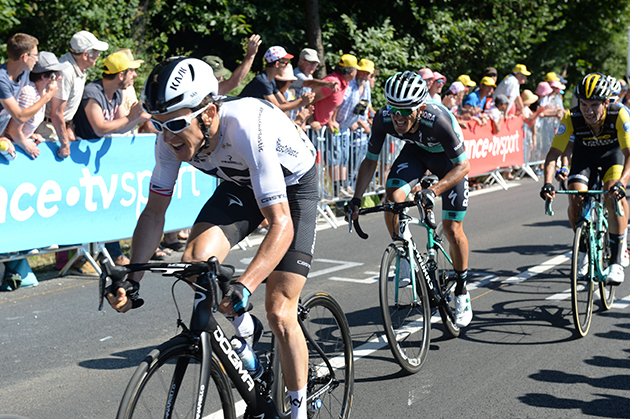 Geraint Thomas powered into second place at the Tour de France following an exciting finish to stage six on the Mur de Bretagne. After securing two bonus seconds at the final intermediate sprint in Saint-Mayeux, Thomas crossed the line ninth as part of a select group atop the tough French climb. 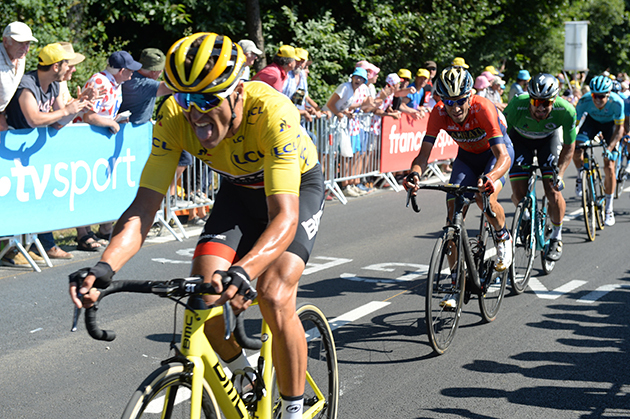 That elevated the Welshman to three seconds off the yellow jersey, while Chris Froome also continued his rise up the general classification into 14th place, one minute and two seconds back on the maillot jaune. Geraint Thomas climbs to the finish and second-place GC. Team Sky put in an assured performance across the stage, making the front group in a brief crosswind section with 100km to go, before pacing the first of two ascents of the final climb. Wout Poels set the tempo first time up the third-category ramp, ensuring Froome and Thomas were well positioned. Michal Kwiatkowski and Egan Bernal then helped drill the pace on the final lap before the climb took hold. In the final kilometre Dan Martin (UAE Emirates) produced an unbeatable kick to claim the stage win, while Greg Van Avermaet’s (BMC Racing) presence in the front group ensured he held on to yellow. On sneaking another pair of bonus seconds he added: “I think everyone will be watching me now. I got away with it twice, I don’t think I could get away with it a third time. It was more just going for it because I saw the opportunity. “In the final I tried to play it a bit too late. I knew it was quite a hard finish so I wanted to try and wait. By the time 200 metres was coming the time had gone. Valverde went so I knew I wasn’t going to beat him for third. So I just stayed where I was and saved that one percent for another day. Following his 4th place in Quimper on Wednesday, Alejandro Valverde came again just short to a fifth career stage win in the Tour de France – in the 13th anniversary of his maiden success in the ‘Grande Boucle’. The Spaniard finished 3rd at the top of the Mûr-de-Bretagne, end of stage six -181km from Brest-, behind the two only riders anticipating the predictable uphill sprint: Dan Martin (UAD, 1st) and Pierre Latour (ALM, 2nd). ‘Bala’ managed himself well through another difficult stage, with some unexpected crosswinds created by Quick Step with over 100km left splitting the bunch into two, and forcing the Blues to push hard to bring Mikel Landa and Nairo Quintana back into position. The two Blues responded well to the work by Soler, Amador, Bennati, Erviti and Rojas, and at the last climb, they didn’t experience any more troubles to follow the GC group and finish with no time loss -Nairo in 13th place, Mikel in 16th-. Valverde climbs onto 8th overall (+51″) as Greg Van Avermaet (BMC) remains in yellow, with Landa now 12th (+55″) and Quintana still 2’10” behind the yellow jersey. Two long, flat stages -no less than 231km scheduled on stage seven, Friday, from Fougères to Chartres- will lead the Movistar Team’s three GC references to the most feared stage in this year’s Tour, over the cobblestones towards Roubaix on Sunday, the last hurdle before the mountains. In its third and final day in Brittany, the Tour de France peloton tackled the second stage of lumpy roads across the region, finishing in a leg-breaking circuit that climbed twice on the harsh Mûr-de-Bretagne, the so-called Alpe d'Huez of Brittany. In another exhibition of strong teamwork and solid effort, BORA-hansgrohe responded to the hard pace of the stage and the crosswinds and brought Rafal Majka and Peter Sagan safely to contest the last and crucial ascent. 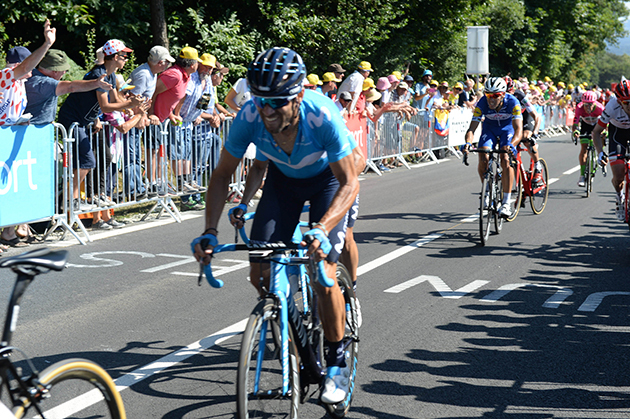 The team's two leaders were inside the select group of riders that crossed the finish line behind the stage winner. With a number of GC contenders conceding seconds on the final climb, Rafal Majka edged up to ninth at the top of the order while UCI World Champion, Peter Sagan, tightened his grip on the green jersey. Just as the terrain on stage 5 made the going tough for the peloton, the parcours for today’s stage was little different. Four categorised climbs dotted the route, with the final climb, the 2km Mûr-de-Bretagne being the day’s focal point. At 2km in length and with an average gradient of 6.9%, this climb would be difficult to conquer just the once after a long day’s racing, but it would actually be ridden twice over a 20km finishing circuit. Riders hoping to make a claim for the stage win would be able to get a feel for the finale on the first ascent, but few would be relishing the idea of a second attempt at the end of the 181km stage. The tough final 20km would make the outcome of the stage difficult to predict. A lot would depend on how the day progressed and how hard the peloton would have to work to draw in the day’s break. The team would be looking to the intermediate sprint at the 135km point to take some extra points in the fight for the Green Jersey, before preparing for the difficult finale on the Mûr-de-Bretagne. Bonifications would be available in the closing kilometres, which would only add to the potential chaos of the finale. It would be essential to keep Rafał Majka safe here, as well as working to bring the UCI World Champion, Peter Sagan, into a good position to fight for the stage win if the opportunity presented itself. The teams that had the breakaway as part of the day's strategy made their intentions clear from the drop of the flag. The second the peloton passed the spectacular numbers of crowds at the neutral part of the race, attacks were launched and a group of five escapees was quickly formed, leaving the peloton one minute adrift in the first kilometers. With the day being all about the Mûr-de-Bretagne and the crosswinds further up the parcours, the peloton was happy to let the breakaway go straight away. The five men at the front saw their advantage creep up to nearly nine minutes before the strong teams came to the fore, putting the hammer down and making their intentions clear. Crosswinds and exposed landscapes wreaked havoc, splitting the peloton into pieces 75km into the race, catching some of the teams off guard in arrears. BORA-hansgrohe had all its powerhouse, safely, at the front of the leading group, sparing them from the effort and energy the laggards spent to make the peloton regroup. 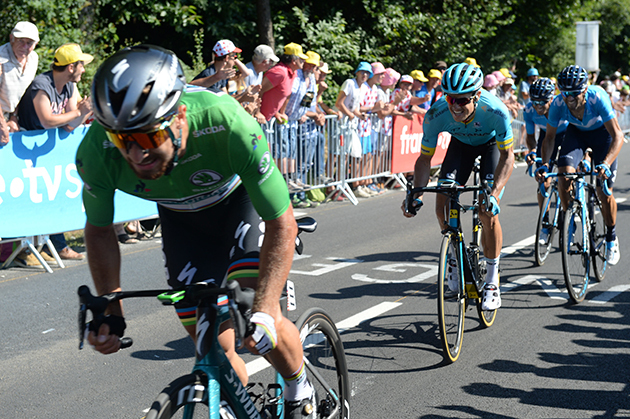 With 45km to go, UCI World Champion, Peter Sagan, contested the intermediate sprint, bagging more points and keeping his main opponents for the green jersey under check. As the peloton entered the finishing circuit and prepared to climb the Mûr-de-Bretagne for the first time, the red and white stripes of Austrian National Champion, Lukas Pöstlberger, headed the bunch, taking turns with Gregor Mühlberger, Daniel Oss and Marcus Burghardt, with the rest of the squad protected. It was a leg-breaking circuit, with the harsh and unforgiving Mûr-de-Bretagne climbed twice. Rafal Majka and Peter Sagan were brought perfectly into position, kicked hard and stayed within the fast-dwindling leading group as the finish line was approaching. A late attack by Daniel Martin brought the Irishman stage victory as some of the main contenders were finding the gradient too hard and were conceding seconds. Rafal Majka and Peter Sagan took fifth and eighth, respectively. Rafal edged up one spot at the top of the order to ninth, 52" behind race leader, while Peter extended his lead in the points classification. Annemiek van Vleuten proved why she is the world time trial champion today by dominating the stage seven uphill time trial in the Giro-Rosa, crossing the line two minutes and 28seconds ahead of her nearest rival to win the stage and move into the overall race lead. Annemiek van Vleuten winning a stage in last year's Giro Rosa. The Mitchelton-SCOTT rider used her knowledge of the course to pace her effort well and continuously take time out of her rivals with each kilometre that passed. The grueling stage left no place to hide with 15 kilometres of uphill road which saw huge time gaps at the finish line in Alte Gera di Campo Moro. It took a while before any riders could beat the 50-minute mark. General classification hopeful Elisa Longo-Borghi (Wiggle-High5) was the first to do so with a time of 49minutes 34seconds. As the third to last rider to start, van Vleuten passed the half-way time check with a time of 23minutes 13seconds, 44seconds quicker than her one of her main rivals Ashleigh Moolman-Pasio (Cervelo-Bigla). 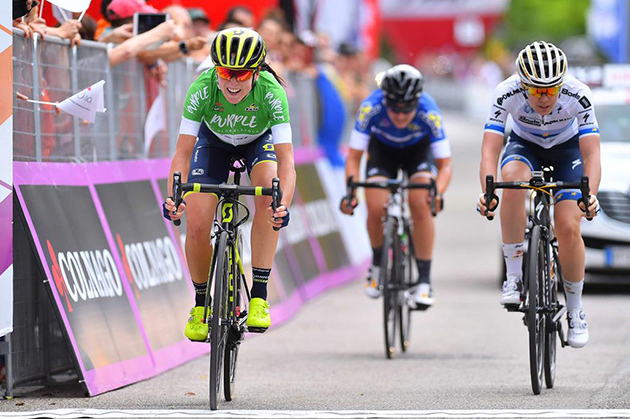 However, van Vleuten didn't ease off the pedals and continued to push for the final eight kilometres, constantly gaining time on the other stage contenders, to eventually cross the line with a huge margain over the rest. Stage 6 winner Amanda Spratt also rode a strong time trial, finishing in fifth place on the stage to stay in contention overall, now in second place overall, two minutes and 53seconds behind her teammate. “I felt really good in my rainbow colours, I’m not sure of the time gap, but I gave it everything out there and I was completely empty at the finish, but also super happy. “I am still feeling good and I think yesterday showed that I’m in good shape, but Annemiek had such a great ride today, I am really proud of her and we are going into the rest of the race with a lot of form and confidence.